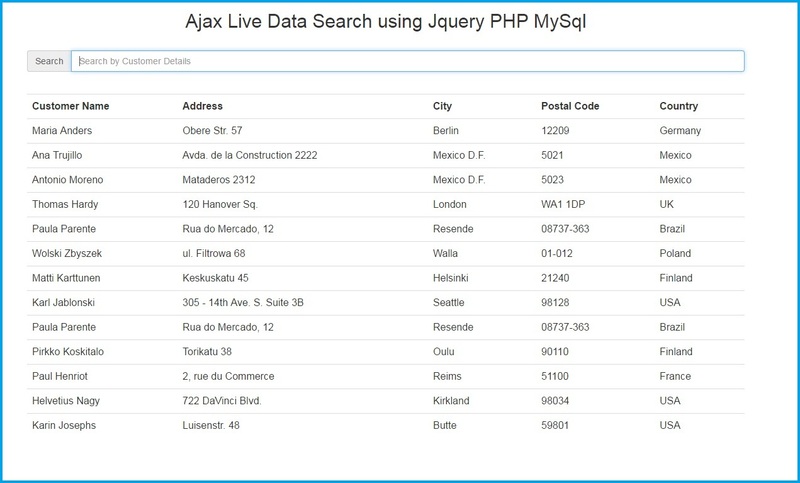 In this tutorial we are going to learn Ajax Live Search with PHP and MySql with Jquery. In most of the site we can see there is one search bar on the site and we can search content of that site. If you have use Facebook or twitter there is one amazing live search functionality available for search new friends or followers. In those site suppose we enter some text for find from those site then we can get instant result from site without page refresh. This functionality is done by Ajax with Jquery. With the help of Jquery we can use Ajax http dom function, with the help of this function it search data on server side and send back result to front end webpage without page refresh. This functionality will give amazing look to your site. I have provide source code with this post. I hope you can learn this things. Bro, if u are not aware of Whtz jQuery & Bootstrap files then u should not be here..
after showing search results how to enter in table to select row on keydown press from search field? How to make search work with Cyrillic symbols? How can I display from another table in single search form ? how can i make it not live but by submin button? my search is not filtering search results as type in the textbox.what could be the problem? Works great! How can the search be made case insensitive? HOW CAN I DO THAT WITH JSP? Hi, thanks for the tutorial!! I have a question, how can export the results to an excel file? How can I modify the JS to display results(call fetch) by default on page load unless search is used ? I don't understand the majority of you guy's questions. It's almost like you want a hand out. I mean seriously people i'm not experienced with bootstraps and all and I got this to work perfectly, first shot on my database, not even following half of the instructions and even have it showing all results. I know some of you may not be experienced or just not learning but damnit, "How do you do this, that, this and that?" Like this dumb question about showing another table on a single search..... SERIOUSLY!??? COMMON SENSE GUYS! HELL GOOGLE IT!!!!! Hi!Please !who can help me to get php pdo version to fetch? Great one! Thank you it helped me. I just want to say thank you for sharing this post, it was really awesome and very informative. Thank you. Hi! I have 1 million rows of data on my database, my browser crashed after a search. Can you help me regarding to this? 1. Can we activate the submit search button so that it will not conduct a query while typing? 2. Can we put a limit on the result table and add pagination so that if the table has a bunch of result, the entire data will not display in a single column or table? Try to input "First" on the search field. can you help me with an advice how can get one result of search and display it in another page (like product_details.php)?